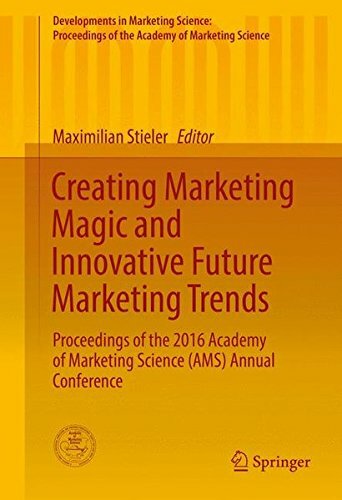 This volume includes the full proceedings from the 2016 Academy of Marketing Science (AMS) Annual Conference held in Orlando, Florida, entitled Creating Marketing Magic and Innovative Future Marketing Trends. The marketing environment continues to be dynamic. As a result, researchers need to adapt to the ever-changing scene. Several macro-level factors continue to play influential roles in changing consumer lifestyles and business practices. Key factors among these include the increasing use of technology and automation, while juxtaposed by nostalgia and “back to the roots” marketing trends. At the same time, though, as marketing scholars, we are able to access emerging technology with greater ease, to undertake more rigorous research practices. The papers presented in this volume aim to address these issues by providing the most current research from various areas of marketing research, such as consumer behavior, marketing strategy, marketing theory, services marketing, advertising, branding, and many more.